Jharkhand state accounts highest percentage of mineral resources of India. The state lie on Chota Nagpur Plateau and many major rivers pass through Jharkhand. Damodar Valley Corporation has a network of four major dams in Jharkhand, such as Maithon on Barakar river, Tilaiya on Barakar River, Konar Dam on Konar river,Panchet on Damodar river. Maithon Dam is constructed on the Barakar river and has an underground power station. The Maithon dam is largest dam in Jharkhand state with an height of 165 ft.
Maithon Dam has the biggest reservoir in Damodar Valley Corporation and has its unique underground power station, which is first of its kind in South Asia. Khandoli Dam near Giridih is an important tourist spot in Jharkhand state and home to thousands of migratory birds coming to India during winter. Khandoli is also a popular place for water adventures sports and developed as a tourism attraction by tourism department of Jharkhand for bird watching and aerial adventure activities. Charowa Dam in Hazaribagh district is best place for bird watching in Jharkhand and home to Critically Endangered species of Indian Vultures. 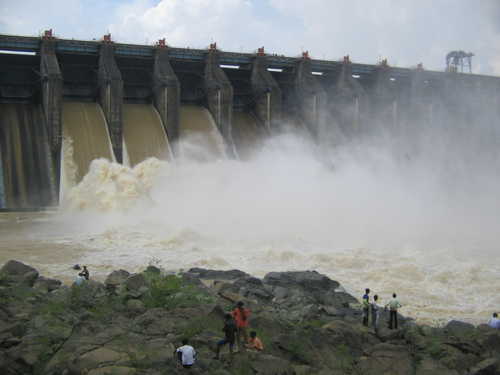 Getalsud Dam near Ranchi is constructed across the Subarnarekha river. The artificial reservoir created by Getalsud dam is famous picnic spot during Chhatt puja. Konar Dam across the Konar river is second multi purpose dam of Damodar Valley Corporation in Jharkhand and has been developed as a recreational spot and tourism. Tilaiya Dam is constructed across the Barakar river as part of the first phase of the Damodar Valley Corporation in Koderma district. Tenughat Dam across the Damodar river in Bokaro district is another major dam in Jharkhand, controlled by the Government of Jharkhand. Panchet Dam across the Damodar river is also part of the phase of the Damodar Valley Corporation. It is an earthen dam with concrete spillway, famous for fish culture with occurrence of freshwater fish like Rohu, Catla,Mrigal and Calbasu.